Five teams from CONNECT involving more than a dozen researchers begin the NDRC’s 2019 Pre-Commercialisation Programme today in Dublin. 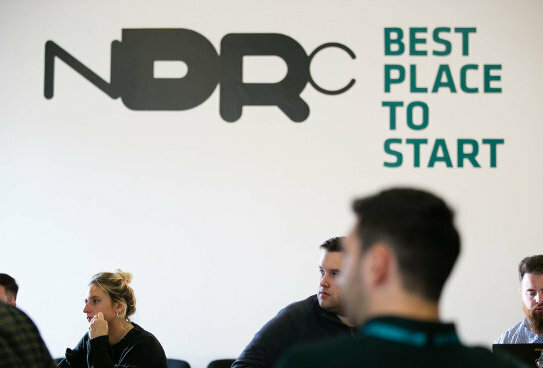 The NDRC builds and invests in early-stage digital companies and startups, offering early stage investment and development support. Here are details of our five participating teams and their projects. CONNECT, Stokes Laboratories, Bernal Institute, University of Limerick. We have developed a novel, patented energy harvesting solution that can be to indefinitely power self-contained sensor devices for the Internet of Things (IoT) applications. Our vision is to develop inexpensive “fit and forget” sensing solutions by replacing wired or battery power supply. This presents not only significant capital savings but also operational cost savings through opportunity for smart maintenance scheduling, reduced downtime, lifetime extension and lower energy consumption. The harvester, a multimodal 2-Degree-of-Freedom (DoF) nonlinear oscillator, consists of a multi-mass combination which exploits a novel, patented velocity amplification principle to enhance the performance of an electromagnetic transducer. The key breakthrough of this new technology is that it captures energy effectively across a wide range of vibrations input frequency. The harvester can be easily tuned via an adjustable cap to match the input vibration source. This unique feature allows for greater application space. Major applications of 5G like intelligent transportation systems, wireless health services, smart grids, smart cities etc. will be served by huge volumes of communication nodes and end-points. These nodes can be relays, repeaters, sensors, actuators and receivers. If each of these nodes are capable of full-duplexing, huge benefits can be acclaimed including 2X spectral efficiency improvement, 2X latency minimization and 10X energy reduction. However, residual self-interference and cross-talk between transmitter and receiver are the show-stoppers in the above-mentioned scenario. To manage mobility, Radio Access Network (RAN) nodes in both 4G and 5G are grouped into a hierarchy of geographical areas. We demonstrate a 4G/5G compliant Network Level Mobility Management Optimization solution based on User Equipment Mobility to minimize signaling (handover signaling, paging and tracking area updates) and handover latency by dynamically reconfiguring the association between nodes in the RAN and nodes (e.g., Mobility Management Entity), functions (e.g. Access and Mobility Management Function) and Location Regions (e.g. Tracking Area, Registration Area, Tracking Area List) in the core network. The network configuration automation is a concept that benefits equally the mobile users (better service), cellular network operators (reduces the need of man-power to configure and optimize the network) and the network equipment vendors (optimized equipment configuration, allowing the nodes to achieve the best performance) and it speeds up the network deployment procedures (node configuration, drive tests). Dr Shagufta Henna, Junaid Ali, Nikita Jalodia. Telecommunication systems are going through a transformation currently where Cloud technologies are allowing Operators to dramatically reduce Capital Expenditure. If this way Operators can execute network functions, previously hosted on dedicated hardware, in a virtualised container and on commodity hardware. This however dramatically increases the complexity of managing such critical infrastructure to ensure robustness, efficiency and quality of service delivered. AutoScale has developed a Machine Learning approach to modelling complex ‘Virtual Service Function Chains’ allowing for accurate prediction of resources and automatic elastic scaling to ensure performance targets are met. Paul Malone, Sidhant Hasija, Mohit Taneja. Management if lameness within herds of cattle is a considerable problem within the global industry. Prevention methods are broadly quite expensive and serve to only limit incidences marginally. Treatment of lameness is also costly when detected late, contributing to the high volumes of antibiotics consumed by the industry globally. SmartHerd is a IoT Machine Learning based Early Lameness Detection system for cattle. The system has been shown to detect early signs of lameness in cattle up to 3 days before visible signs recognisable to the farmer are observed. Early treatment of lameness has the potential to increase the productivity of the herd as well as minimise the volume of antibiotics consumed.